Cupcakes 'n Daisies: Inspi - red . . . . . I hope you had a fun and relaxing weekend. I woke up early Saturday morning with the urge to take every item out of my kitchen cabinets, spread it all over my countertops, then put it all back in, nice and neat. Luckily that urge passed as quickly as it came. I was going to go with A Mazing Abundance, but at the very last minute I decided to go with Father's Fancy. I've been thinking about the Infinite Variety of Red and White quilt show and maybe making a tribute quilt, and thought that maybe hanging that quilt would motivate me. Out of all the great pictures I've seen of the quilt show, this one is my favorite. So, I was thinking about doing some sort of tribute quilt sometime, but now I have a great reason to not only get going on a tribute quilt but to finish it by the first of September! The Temecula Quilt Company, in Temecula, California is hosting a Red and White Quilt Challenge in honor of the Red and White Quilt Show. If you live in the area, your quilt will be displayed in the shop, but if you live far away, like me, you can just send a picture of your finished quilt and still participate! Click here for all the details. Everyone who enters gets a gift plus there will be a grand prize giveaway. I'm in! Why don't you join in on the fun! 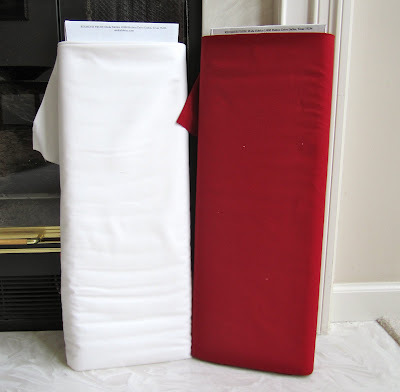 I'm going with Moda's Bella Solids in Country Red and White for my fabric. At first I was thinking of going with the antique white, but decided it was too yellow. I'm still working on the details of the pattern. Cooper's getting into the Red & White spirit of things too, every time I put food in his red food bowl he eats it. 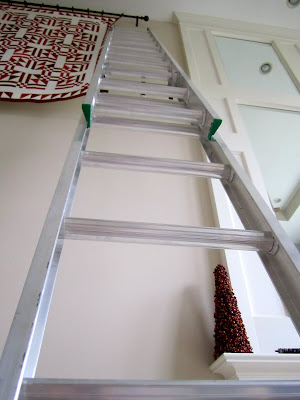 I'm guessing Cooper's saying, "please, can I just eat in peace"
Whenever I blog about swapping my living room quit, someone always wants to know how I do it. . . .
All it takes is a very tall ladder. I enjoyed all your comments about your favorite quilt color. Not surprisingly, red was by far the most popular color. But when the giveaway is for a pattern with a gorgeous red quilt on the cover, I figured I would attract some fans of red. Blue was the second most popular, that didn't surprise me either, blue is a very popular color. The color that came in third and that was really close to blue was a surprise to me, GREEN! I have green in a few quilts, not because I like green, I find green hard to match and coordinate, but because the green is just part of a family of fabrics. I have a few green fat quarters but no yardage to speak of. The next most popular color was brown and autumn colors. I'm with you there, I love fall colors too, I don't have near enough fall colored quilts. After fall, pink and purple tied. I think everyone should own at least one purple quilt, and I do have one quilt with a lot of purple. The funny thing, the person who said they put purple in almost every quilt thought they should own at least one red quilt. My bizarro world twin! For as crazy as I am about pink, I'm surprised I don't have any quilts with pink, but Long Tall Sally will fix that. And now, for the winner of the Scarlett Queen pattern by Carrie Nelson for Miss Rosie's Quilt Co.
"This is a great quilt! I've been wanting to make something in red and white, as I haven't yet. I don't think I have a favorite color quilt; looking at the ones I've made, they're all very different. This could be due to the fact that I've only been quilting 2 years and am still trying out different styles & techniques. I may be close to finding my voice, though..."
Changing out your quilt looks scary! I'm looking forward to seeing what you do with the red and the white. You're always up to something good! I love this quilt - of course! Red and white is just perfect!!! Impressive ladder climbing skills, too! What a hoot about Cooper eating anything you put in a RED bowl!!! Can't wait to see what you come up with for the red and white fabric! Really? REALLY???????? You climb that ladder AND do something once you get to the top?????? No way; no how!!! uh-uh...NOT this chicken!!! you.be.careful.and.don't.climb.without.someone.else.there. I don't think I could climb that ladder. Scary! Can't wait to see what you come up with for a red and white quilt for the challenge. Congratulations to the winner! And Thelma... I am so glad that you came to your senses on Sat. morning!!! hehe! The cupboards are just fine:) That is an intimidating ladder though... crimini- not something you want to do every month is it? beautiful quilt. (i had troubles with leaving comments too) glad your journey up and down the ladder was safe!! Love your R&W quilt! I guess I'm the oddball, I like ladders!~ I like the perspective. ;-) Have a happy day! oh I think I would leave that quilt up a bit longer if I had to climb that ladder to change it! can't wait to see what you make for the challenge. it was incredible walking into the show and seeing just that! Wonderful red & white quilt, I will follow you for this challenge ! Can't you put a draw-pull-cord assembly on the curtain rod and hang the quilt from your perch on the balcony? I admire your courage! Thanks for the heads up about the Temecula Quilt Company doing the red/white challenge. They are only 30 minutes from me--I'll participate in person. It's funny how you are farther away, but I find out the news from you about a local shop! Your red/white quilt is stunning. I do think you made great quilts and I enjoy reading your blog to see what you are up to next. I, too, am in love with the red/white quilt show photos from New York. I downloaded the app onto my iPhone, and the pictures are teensy, but at least I can see them all. I also downloaded the app onto my mother's iPad--which takes bigger screenshots--and posted about them on my blog as well. Okay--off to quilting with a friend--just wanted to say a thank you! Just found your blog, love it! I also love red and white quilts. I have free instructions for the Vortex quilt from the Infinite Variety show on my blog at Quiltrascal.blogspot.com. Also a 1910 red and white school house quilt in small size. I have a small quilt like your Father's Fancy I reproduced from a book. I also need a ladder to hang it. Take a look at my blog and share it with other quilters. I am new to blogging, will not post often, but want to share the instructions I have done. I have a Flickr link to photos of some of the quilts I have made. Now back to reading more of your blog!